Theresa May has set out her justification at the House of Commons for joining the US and France in launching military airstrikes in Syria on April 14, without parliament's approval. The UK PM blamed the "Syrian regime" for an alleged chemical weapons attack in Syria's Douma. "We are clear about who is responsible. A significant body of information including intelligence indicates the Syrian regime is responsible for this latest attack," May told the MPs. "When the Cabinet met on Thursday we considered the advice of the attorney general. Based on this advice we agreed it wasn't just morally right but also legally right to take military action together with our closest allies to alleviate further humanitarian suffering." "The Syrian regime has reportedly being attempting to conceal the evidence by searching evacuees from Douma to ensure samples are not being smuggled from this area, and a wider operation to conceal the facts of the attack is underway, supported by the Russians," May told the parliament. Jeremy Corbyn, responding to May's statement, called on the PM to publish the advice by UN's Antonio Guterres approving the action, in full. "The prime minister has assured us that the attorney general had given clear legal advice approving the action. I hope the prime minister will now publish this advice in full today," Corbyn told the parliament. Britain's Prime Minister Theresa May makes a statement to MPs in the House of Commons in London, Monday April 16, 2018 over her decision to launch air strikes against Syria. The attack according to Mrs. May was not about intervening in Syrian civil war. "It was not about regime change. It was about a limited, targeted and effective strike that sought to alleviate the humanitarian suffering of the Syrian people by degrading the Syrian regime's chemical weapons capability and deterring their use," she said. Britain joined its allies — the US and France — in launching missile strikes in Syria on April 14 in response to an alleged chemical weapons attack in Douma. The attack has been criticized for hampering the efforts of the OPCW to conduct investigations on the ground. 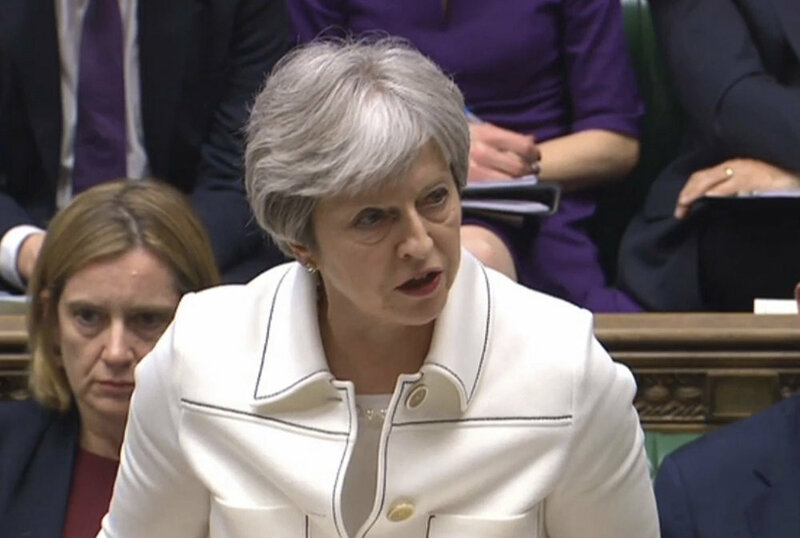 May explained why London undertook a military response before the Organisation for the Prohibition of Chemical Weapons (OPCW) investigation even started. "UNSC-mandated inspectors have investigated previous attacks on four occasions and decided that the regime was indeed responsible. We are confident in our own assessment that the Syrian regime was highly likely responsible for this attack, and its persistent pattern of behavior meant that it was highly likely to continue using chemical weapons. Furthermore, there were clear attempts to block any proper investigation as we saw with the Russian veto at the UN earlier in the week." The British PM told members of the parliament that Britain acted "in Syria in our national interest, not just following US President." "We have not done this because President Trump asked us to, we have done it because we believed it was the right thing to do, and we are not alone. There is broad-based international support for the action we have taken." 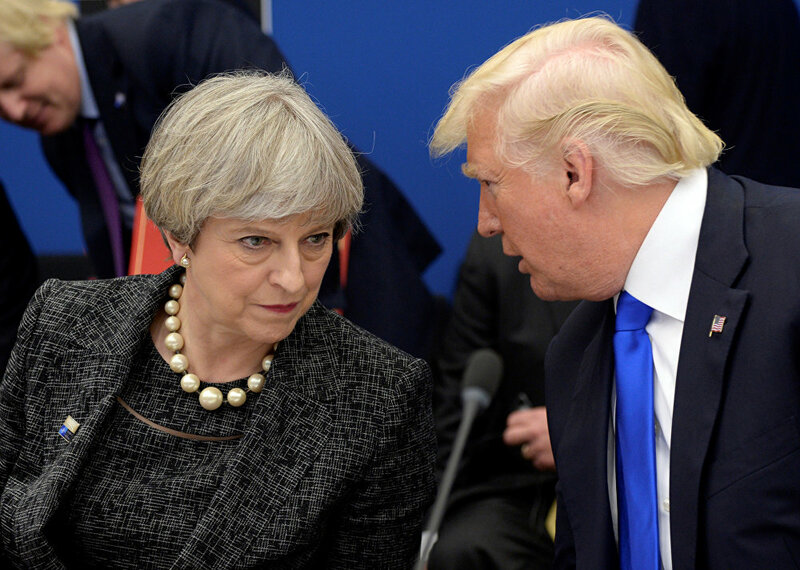 US President Donald Trump, right, speaks to British Prime Minister Theresa May in a working dinner meeting during the NATO summit of heads of state and government at the NATO headquarters, in Brussels on Thursday, May 25, 2017. Jeremy Corbyn called May's decision to authorize military action "legally questionable." Former Conservative Chancellor Ken Clarke put a question to the PM about the role of Parliament is in modern times regarding the use of military power against another state". May said it is her responsibility as Prime Minister to make such decisions. "Third, why did we not recall Parliament. Mr Speaker, the speed with which we acted was essential in cooperating with our partners to alleviate further humanitarian suffering and maintain the vital security of our operations. This was a limited targeted strike on a legal basis that had been used before. And it was a decision which required the evaluation of intelligence and information, much of which was of a nature that could not be shared with Parliament. We have always been clear that the government has the right to act quickly in the national interest… It is Parliament's responsibility to hold me to account for such decisions, and Parliament will do so. But it is my responsibility as prime minister to make these decisions," she explained. The UK PM also spoke about the timing of the strikes. "The timing was such that enabled proper planning to take place so it was a targeted and effective set of strikes, that it was done in a timely fashion and also did maintain the operational security of our armed forces. Any prime minister, who commits any of our armed forces into action of this sort, must have the care of their safety and security in doing so." The PM continued: "I have to come to the Parliament with statement on the action that took place. As I said in my statement, Parliament will hold me to account for the decision taken." A number of MPs have criticized the PM over the weekend for avoiding parliamentary debate prior to engaging the country in a military attack abroad. Hilary Benn: “May I say gently to the PM, that she should have come to Parliament first… [and if it happens again] she should trust PArliament to decide”. "Nobody should be in any doubt of our resolve to ensure that we cannot see a situation where the use of chemical weapons is normalized." The PM said Britain will continue to press for access to those people in Syria who require it. According to May, the attack was about "degrading the chemical weapons capability and the prevention of future humanitarian suffering." "A policy of inaction would also have severe consequences. Those who would turn a blind eye in pursuit of some moral high ground should also be held accountable for once today as well." In her previous statement on Syria, after the airstrikes launch, Mrs. May said "a significant body of information including intelligence indicates the Syrian regime is responsible for this latest attack." "I can't be impolite in regard to the heads of other countries, but you're citing leaders of the US, the UK and France. Speaking frankly, all proofs that they're referring to, based on media and social networks," Mr. Lavrov said. There is no legal requirement for the commander in chief — Theresa May — to receive parliamentary approval to authorize military action. However, numerous precedents in the past set a pattern of British leaders holding a House of Commons debate prior to engaging UK forces in military operations. In 2003, the Parliament was asked to approve military deployment in Iraq, following the motion led by then PM Tony Blair. The motion was carried by 412 votes to 149. In 2011, the House of Commons voted by 557 to 13 to support the government motion for the use of force against the Libyan leader Muammar Gaddafi. In 2013, then Prime Minister David Cameron called for military response in Syria followed a suspected chemical weapons attack on 21 August. He lost the motion by 285-272, which ruled out joining US-led strikes. In 2015, British MPs voted to authorize UK's participation in airstrikes against Daesh militants in Syria. The vote saw 397 to 223 politicians in favor of military action.